Multiple paths to storage devices can provide connection redundancy, failover capability, load balancing, and improved performance. Device-Mapper Multipath (DM-Multipath) is a multipathing tool that allows you to represent multiple I/O paths between a server and a storage device as a single path. You would be most likely to configure multipathing with a system that can access storage on a Fibre Channel-based storage area network (SAN). You can also use multipathing on an iSCSI initiator if redundant network connections exist between the initiator and the target. Between host bus adapter hba1 on the server and controller ctrl1 on the storage array. Between host bus adapter hba2 on the server and controller ctrl2 on the storage array. 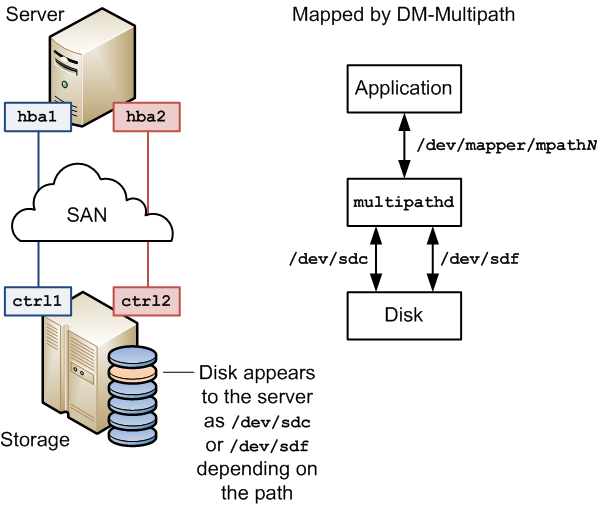 Without DM-Multipath, the system treats each path as being separate even though it connects the server to the same storage device. DM-Multipath creates a single multipath device, /dev/mapper/mpathN, that subsumes the underlying devices, /dev/sdc and /dev/sdf. I/O is distributed across all available paths, either by round-robin assignment or dynamic load-balancing. I/O uses only one path. If the active path fails, DM-Multipath switches I/O to a standby path. This is the default configuration. DM-Multipath can provide failover in the case of path failure, such as in a SAN fabric. Disk media failure must be handled by using either a software or hardware RAID solution.